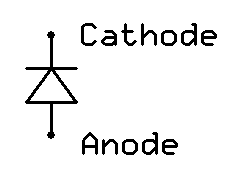 Two leads – Anode and Cathode (Conventional Current flows from A to C, alphabetical order). Current flows one way, but not the other. Current flows when the device is forward biased, that is, positive voltage applied to the anode and a smaller voltage level applied to the cathode. Reverse Biased – Current doesn’t flow. Minimum Forward Bias = 0.7 volts. Rated by the maximum current that can flow and the maximum reverse bias voltage. For Example: A 10V DC power supply powers a circuit with a diode and resistor in series. The diode is forward biased. Find the total current in the circuit. There are four steps to convert AC to DC. 1. AC input into a transformer to reduce the AC voltage. 2. Convert the reduced AC into a rectified voltage. 3. Filter the rectified voltage with a capacitor across the output of the rectifier. 4. Regulate the voltage level at the output of the rectifier to keep the voltage output constant. High power and higher efficiency systems make use of a DC to DC converter, for example a Buck Converter or Boost Converter. For Example: A DC power supply has a transformer operating at 85% efficiency, a rectifier and capacitor that operate (combined) at 98% efficiency, and a Buck Converter (voltage regulator) that operates at 92% efficiency. The power supply has a 24V output and is drawing 5A. The input is 110Vac. How much current is being drawn from the 110Vac input? Answer: First we must determine the output power. Watt’s law says that P=IV therefore our power = 24V x 5A = 120W. The efficiency of the regulator is given as 92% therefore our power divided by 92% = 130.435W. The previous stage (rectifier/capacitor) operates at 98% therefore the power supplied into this stage is 130.435/.98=133.097W. The transformer is operating at 85% and its power output is 133.097W and therefore the input power is 133.097/.85=156.584W. This power is the input to the power supply and now we can find the current using Watt’s law, P=IV or I=P/V=156.584/110=1.423A. The two leads of a diode are? 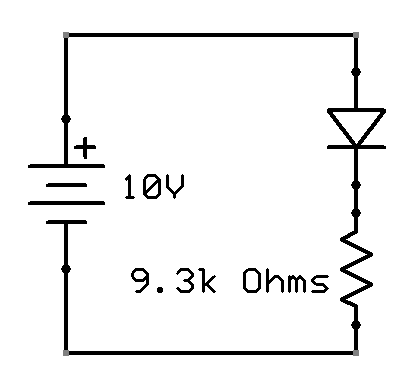 The forward bias voltage of a diode is normally _________. A 24V battery is connected to a 233 Ohm resistor and diode in series. The diode is connected such that current is able to flow. What is the current in the circuit? Assuming that the power dissipated in a component is the voltage across the component times the current flowing through it, what is the power dissipated in the diode from the above problem? True or False, A 3-Terminal Voltage Regulator is normally more efficient than a DC-DC converter. 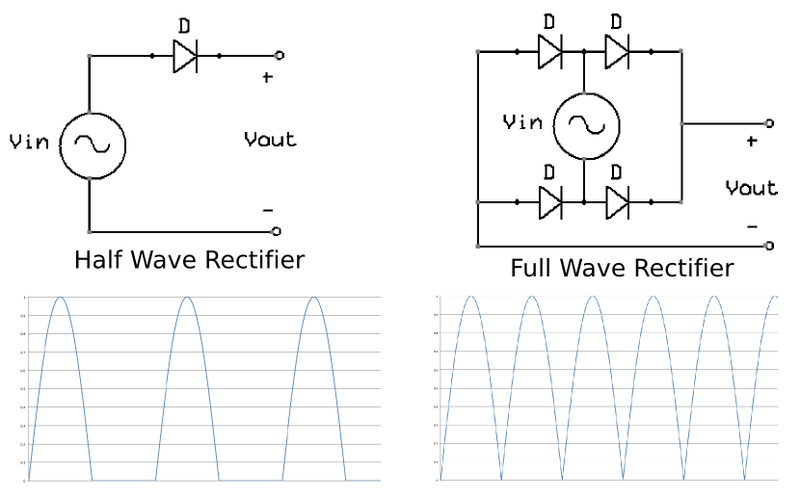 How many more diodes are contained in a full wave rectifier than are contained in a half wave rectifier? Of the four parts of a DC power supply the DC Voltage Regulator is the only one that is operating below 100% efficiency. It operates at 93%. If the power being supplied from the AC source is 150W what is the power being supplied to the load? If the power supply in the above problem is set at 24V output what is the current that flows into the load? Each of the four pieces of a DC power supply are operating at 85% efficiency. 300W of power is being drawn from the AC input what is the power being delivered to the load? 10. A 24V DC power supply is used in a commercial HVAC system to power the electronic controls. The designer specified a 300W (max) dc power supply in the prints but you are asked to verify that it is large enough and not way too large for the system so you need to add up all of the load powers to make sure the system will work. You find that it is operating 6 different pieces of the system. Four of those six pieces are labeled with the power they require, each at 50W. The remaining two are HVAC control relays that turn on and off large blowers. These relays from your standpoint are just like resistors so you measure their resistance and you find 15 Ohms each. 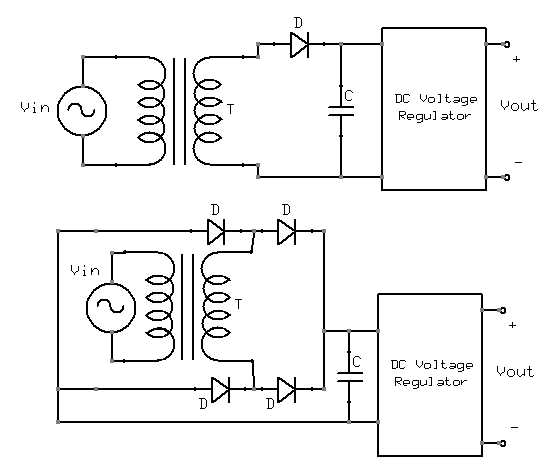 These two relays operate in parallel on the dc side. Is this power supply sufficient for it assigned task? 11. A DC power supply is being used as a battery charger for your 12V battery. The charging voltage for the battery is 13.5V and its optimum charge current is 2A. The battery charger has an efficiency of 78% and it took 8 hours to charge with an input of 110Vac. If your residential electricity cost is 10 cents per kW what did it cost you to charge your battery? I’m trying to figure out number 10, but I can’t figure out how without knowledge of either the voltage or the current within the system. Any hints? I am also having issues figuring out how to set up an equation for #11. Will you be in your office at all tomorrow? Use 24V as the power supply voltage in number ten. In number 11 there is unneeded information. Find the output power, use the efficiency and the output power to find the input power, find the energy consumed using time and input power and finally find the cost using the energy and the cost per kWh. I will be in my office today or in the lab from 8-9, 1-3 (in the lab), and 3-5.